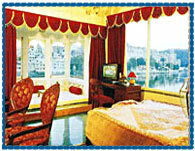 Hotel Lake Pichola Udaipur, Lake Pichola Hotel Udaipur, Reservation for Hotel Lake Pichola, Udaipur, India. Accessibility: 25 kms. from Airport, 3 kms. from Railway Station, 3 kms. from Bus Stand. 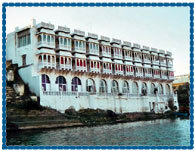 Hotel Lake Pichola isideally situated on a peaceful island "Bramhapuri" on the western Banks of Pichola Lake and the opposite ghat of historical Bagore ki Haveli. It is a government approved three star hotel overlooking the magnificent city palace, the oldest Jagdish Temple, Bathing Ghats and Embankments and providing the best amenities. Hotel offers 31 luxurious rooms and suites with oriental furniture and befitting a palatial abode decor having all the guest amenities for comfort. 24 Hours Room Service, Maharana Restaurant, Laundry, Car Rental, Doctor on Call, Folk Music and Dance, Puppet Shows, Shopping Arcade, Credit Cards, Postal Services, Banquets and Conferences with Secretarial Services.